Influenced by the renowned culture, science, art and music scene of its top location, ibis Styles London Kensington has opened its doors, taking guests on a fun and quirky educational tour even while they are inside the hotel. Each ibis Styles hotel boasts its own distinctive design, great location and ‘all-inclusive’ offer at a great price with loads of little extras and this beautiful hotel is no different. Featuring bright designs showcasing some of the world’s most famous sights including the Royal Albert Hall, Science Museum and Victoria & Albert Museum, the ibis Styles London Kensington boasts 115 bedrooms, public lobby, breakfast area, Kids’ corner and web corner all only two minutes from Earl’s Court Station. From the second guests enter the fully renovated Victorian hotel building they will be struck by the colourful illustrated map of the area highlighting the attractions which are only a stone’s throw away from the hotel. Every hotel bedroom guarantees character and comfort with features such as the Sweet Bed by ibis Styles, en-suite bathrooms with state-of-the-art showers, full-length mirrors and a flat screen television as well as more practical amenities such as free Wi-Fi, air conditioning and tea and coffee making facilities. 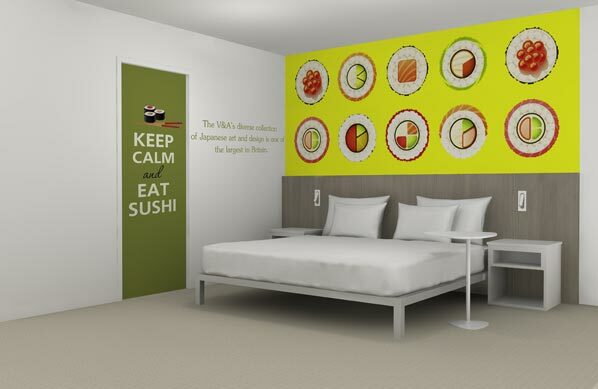 Quotes and graphics fill the rooms and corridors, adding entertainment to guest stays and making the kids interested in visiting the many educational attractions on the doorstep. The breakfast room is inspired by the nearby Natural History Museum. It is in this vault-themed space that guests can enjoy an unlimited continental breakfast buffet ensuring they start the day energised and ready to enjoy all that the city has to offer. ibis Styles prides itself on offering well located properties and the ibis Styles London Kensington is no exception. Kensington Palace, the Royal Albert Hall, Victoria & Albert Museum and Earls Court Station are all just moments away ensuring visitors are within easy reach of the Capital’s cultural offerings. Business travellers on the other hand can appreciate the hotel’s proximity to trade venues like the Earls Court Exhibition Centre, and direct links to Heathrow Airport. That said, the free Wi-Fi throughout the hotel means working guests might not need leave the hotel to ensure deadlines are met. Van Ooteghem added: “ibis Styles has once again gone beyond what is expected from a budget hotel to deliver a stylish, interesting and fun place to stay.